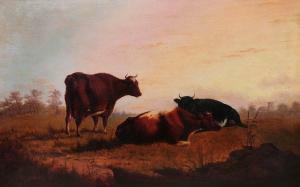 Find artworks, auction results, sale prices and pictures of J. Metcalfe at auctions worldwide. Figures gather and converse during an autumn harvest in this charming painting. Although no details appear to be available for this artist, this painting continues the tradition of harvest scenes of earlier artists Thomas Hearne and George Stubbs. Set in the Yorkshire valley of Wensleydale, the distinctive steeple of St Mary's Church in Masham rises above the trees in the middle distance. In the graveyard rest the local artist Julius Caesar Ibbetson and Sir Abstrupus Danby (1655-1727) amongst others. 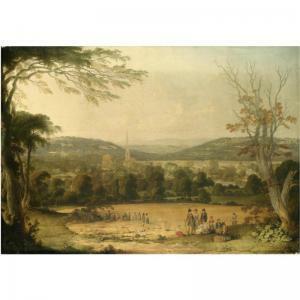 Danby was a prosperous wool merchant and Deputy Lieutenant of Yorkshire who lived at Swinton Park which is just visible in the trees on the left of this painting. Swinton Park was originally purchased by Sir Abstrupus Danby in 1695. Lavishly designed and with no less than five ornamental lakes it was completed by 1760, whilst the tower and castellated battlements depicted here were a nineteenth century addition. 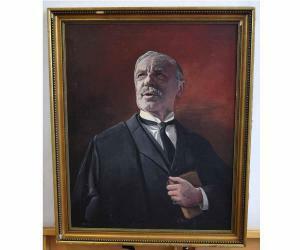 Swinton Park was later bought by the Cunliffe Lister family in 1882 where presumably this painting once hung.